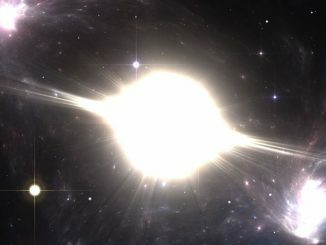 The accelerating expansion of the universe may not be real, but could just be an apparent effect, according to new research published in the journal Monthly Notices of the Royal Astronomical Society. The new study — by a group at the University of Canterbury in Christchurch, New Zealand — finds the fit of Type Ia supernovae to a model universe with no dark energy to be very slightly better than the fit to the standard dark energy model. Dark energy is usually assumed to form roughly 70% of the present material content of the universe. However, this mysterious quantity is essentially a place-holder for unknown physics. Current models of the universe require this dark energy term to explain the observed acceleration in the rate at which the universe is expanding. Scientists base this conclusion on measurements of the distances to supernova explosions in distant galaxies, which appear to be farther away than they should be if the universe’s expansion were not accelerating. However, just how statistically significant this signature of cosmic acceleration is has been hotly debated in the past year. The previous debate pitted the standard Lambda Cold Dark Matter (Lambda CDM) cosmology against an empty universe whose expansion neither accelerates nor decelerates. Both of these models though assume a simplified 100 year old cosmic expansion law — Friedmann’s equation. Friedmann’s equation assumes an expansion identical to that of a featureless soup, with no complicating structure. 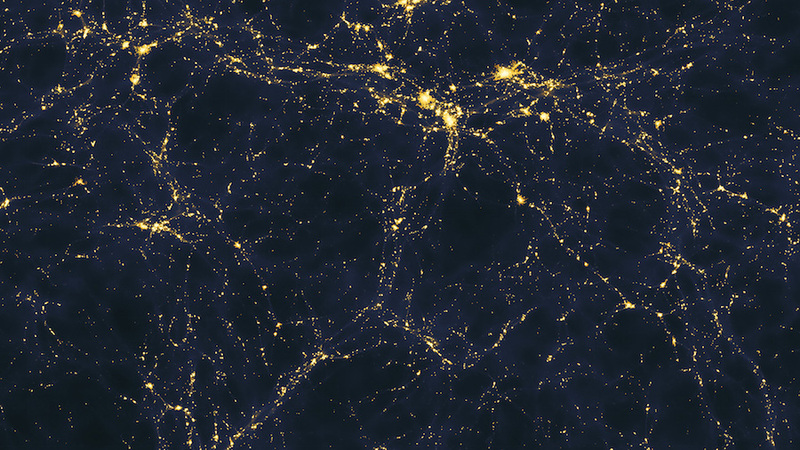 However, the present universe actually contains a complex cosmic web of galaxy clusters in sheets and filaments that surround and thread vast empty voids. Rather than comparing the standard Lambda CDM cosmological model with an empty universe, the new study compares the fit of supernova data in Lambda CDM to a different model, called the ‘timescape cosmology.’ This has no dark energy. Instead, clocks carried by observers in galaxies differ from the clock that best describes average expansion once the lumpiness of structure in the universe becomes significant. Whether or not one infers accelerating expansion then depends crucially on the clock used. The timescape cosmology was found to give a slightly better fit to the largest supernova data catalogue than the Lambda CDM cosmology. Unfortunately the statistical evidence is not yet strong enough to rule definitively in favour of one model or the other, but future missions such as the European Space Agency’s Euclid satellite will have the power to distinguish between the standard cosmology and other models, and help scientists to decide whether dark energy is real or not. Deciding that not only requires more data, but also better understanding properties of supernovae which currently limit the precision with which they can be used to measure distances. On that score, the new study shows significant unexpected effects which are missed if only one expansion law is applied. Consequently, even as a toy model the timescape cosmology provides a powerful tool to test our current understanding, and casts new light on our most profound cosmic questions. Five years ago, the Nobel Prize in Physics was awarded to three astronomers for their discovery, in the late 1990s, that the universe is expanding at an accelerating pace. Now, a team of scientists led by Professor Subir Sarkar of Oxford University’s Department of Physics has cast doubt on this standard cosmological concept. On the largest scales, galaxies and everything they contain are concentrated into filaments that stretch around the edge of enormous voids. 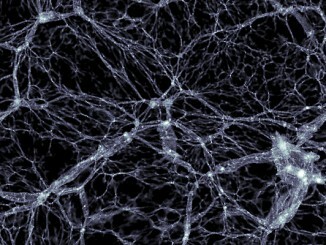 Data from the Illustris project, a large computer simulation of the evolution and formation of galaxies, suggests that the black holes at the centre of every galaxy are helping to send matter into the loneliest places in the universe. 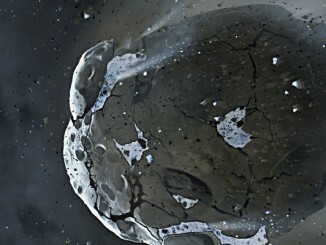 New research strongly suggests that water delivery via asteroids or comets is likely taking place in many other planetary systems, adding further support to the possibility water can be delivered to Earth-like planets via such bodies to create a suitable environment for the formation of life.